O’Leary runs to the beat of his own steps. As O’Leary approached his 50th birthday and was unhappy with various aspects of his life, two pivotal moments occurred that encouraged his return to the world of running. First, he received a message from a friend, inviting him to run in the Toscobia Winter Ultra, a 35-mile race in the snow in Wisconsin. As O’Leary sat and contemplated this invitation, another moment arrived. He was sitting around a bonfire with friends, listening to three of them share their personal battles against cancer. He realized at that point that life was short, and he needed to switch gears—do something different and more meaningful with his life. O’Leary signed up for that 35-mile snow race and hasn’t looked back. Since that race in January 2015, it has lead to a whole host of other events that O’Leary has competed in, each one seeming to get bigger and more challenging. After the 35-mile snow race, it led to trail races, which are completed off-road on rugged, rocky, dirt-filled trails and unpaved roads. First was a 50-mile trail race, followed eventually by a 100-mile trail race. To add to the mix, Spartan racing entered the picture. O’Leary had been doing CrossFit workouts on his own and had lost 50 pounds. He came across an article on Spartan racing during his workout and thought it looked intriguing. Always looking to push himself to a new level, he thought that if a race like that ever presented itself in Minnesota, he would give it a try. In June 2015, O’Leary had such an opportunity. He ran the Minnesota Spartan Sprint at Welch Village Ski Resort in Welch, and finished 89th out of 180 participants. 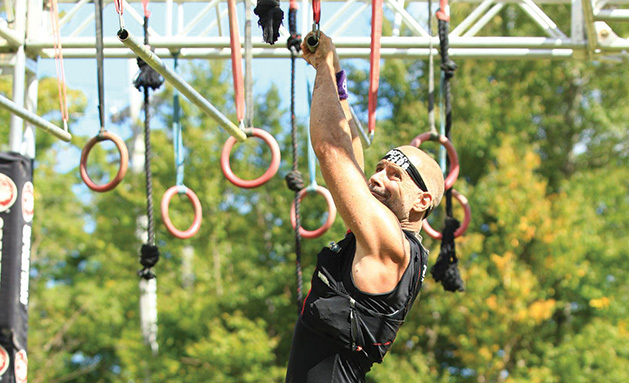 Spartan racing, in a nutshell, is a unique physical endeavor and not for the weak of heart. It was created in the mountains of Vermont in 2010 and has expanded to 200 races in 30 countries. They include obstacle course races that are meant to challenge the athlete both mentally and physically. 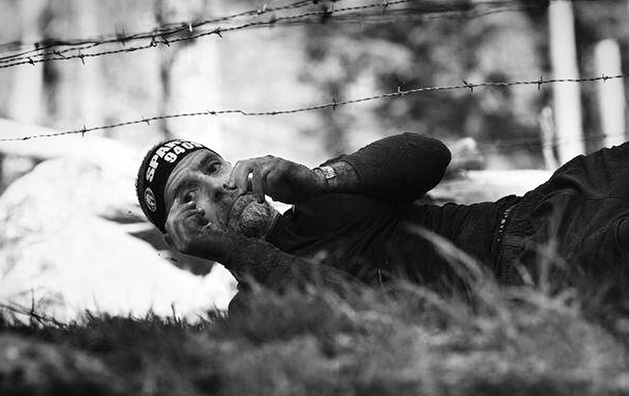 They range from a three- to five-mile course with 20-23 obstacles, known as the “sprint” to the “super” at 8-10 miles with 24-29 obstacles, followed by the “beast,” which consists of 12-14 miles of 30-35 obstacles to the “ultra,” which includes 30 miles of 60+ obstacles. Obstacles throughout the course can include flipping 400-pound tires, climbing a 20-foot rope, crossing uneven monkey bars, carrying sandbags and crawling through mud under barbed wire. The athlete is allowed one attempt at each obstacle. What is the punishment for not completing an obstacle? It would come in the form of doing 30 burpees before moving on to the next obstacle challenge. 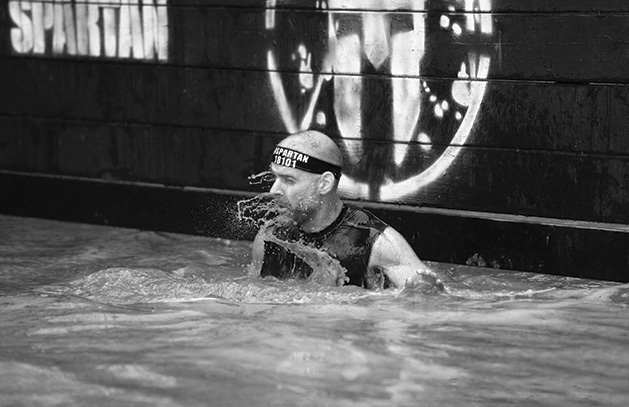 After completing the Spartan “sprint,” O’Leary’s next thought turned to elevating his personal challenge meter. He decided to compete in the “sprint,” “super” and “beast” Spartan races within the same calendar year to earn the Trifecta award. He has accomplished this for three consecutive years from 2016-2108. 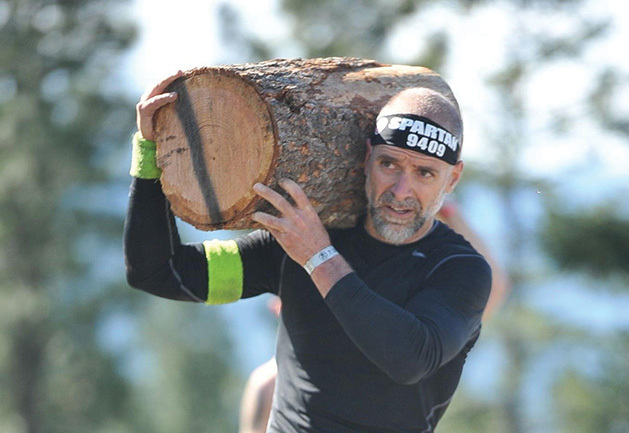 He has also managed to add the “ultra” Spartan race to his race schedule in 2017 and 2018, finishing first in his age division in 2018. The ultra race provided “the ultimate expression of mixing running with Spartan racing,” O’Leary says. O’Leary is always looking ahead to the next challenge. He views it “like an astronaut where I want to expand my universe and see what else I can do,” he says. O’Leary has set his sights on the 200+ mile trail run in the Moab Desert in Utah in 2020. How does O’Leary train for all of these events? “You have to train like you race,” he says. It starts at 4 a.m. with a specific morning routine that includes drinking green tea, reading and setting his mind for the day, followed by a very regimented and disciplined program, including doing deadlifts and squats at the gym, tire pulling or lunges at Elm Creek Park, spear throwing in his backyard and running 50 miles per week. After four years of training at this vigorous pace, he not only feels more centered, but at peace and has found more joy in his life and in his relationships. O’Leary has other passions—including depression2extinction (d2e). He serves as an ambassador athlete to represent the organization. His goal is to raise money, as well as awareness, to end the stigma of depression, something that is near and dear to his heart, as he battles it, as well. In January 2018, O’Leary launched a blog, Over 50 Badasses. It wasn’t something he intended to do, but after being prodded by a friend, he decided to pursue it further and used it as a creative outlet. He wanted to celebrate others in the 50+ age group that rebel against the norm. Over the course of the year, he has talked to inspiring individuals, who are everyday warriors, who have had something unique and uplifting to share about their journey. Darla O’Connor, of Woodbury, has been featured on O’Leary’s blog. Her running career, like O’Leary’s, started in high school. She ran cross-country and placed seventh in the state her first year on the team. After that, she was hooked on running and decided to continue her running career by competing in college. Following college, O’Connor ran marathons in her 20s and 30s, where she placed within the top 10 in her age group in each race that she ran. O’Connor hit a bump in the road in 2012 and went through a personal struggle that led to depression, which spiraled. After going through a divorce in 2014, she worked her way out of her depression and decided that she not only wanted to run a marathon again, but she wanted to set a personal record. She hired a running coach, who helped her achieve that goal. O’Connor’s running coach pushed her to consider Spartan racing as another way to pursue physical fitness. She gave it a shot. It was rough at first, but after training and working on grip strength and obstacle proficiency, she qualified for the Spartan World Championships in the Elite/Pro wave 2016. Unfortunately, she suffered severe hypothermia during the championships and was pulled from the race and taken away by ambulance. This setback didn’t stop O’Connor from trying again. In 2017, she qualified for the Spartan World Championships and placed 12th in the world in her age group. O’Connor experienced a severe hamstring tear and had surgery in late October, but she has no doubt that she will be back in the midst of racing in 2019. O’Connor’s advice through all of this, “Embrace your inner youthfulness and challenge yourself daily; you can rest when you’re 80,” she says.